In the year 587/6 BCE, Jerusalem was conquered and utterly destroyed by the Babylonian king Nebuchadnezzar (2 Kings 25:8-10; Jeremiah 39:8; 2 Chronicles 36:18). Vivid evidence of the Babylonian destruction of the city was uncovered all over the city. Most important among the remains were three buildings from Stratum 10 in excavation Area G (a plan of Jerusalem during the Iron Age at the left shows the location of Area G; hover over to enlarge; image courtesy of the Institute for the Visualization of History). 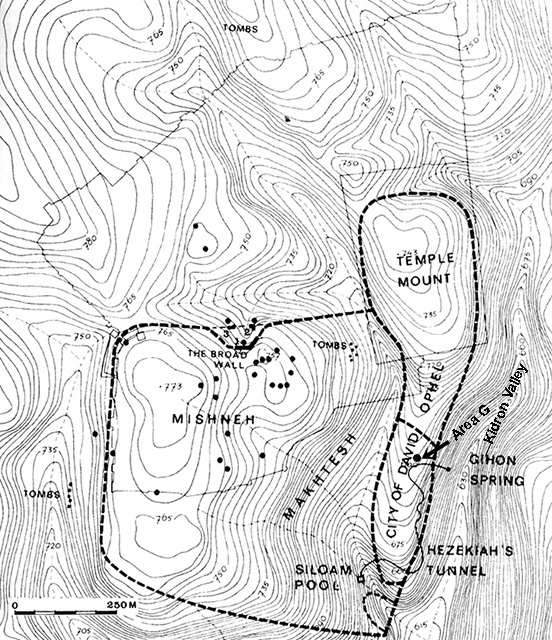 The deep trench named Area G (on the eastern slopes of the City of David, just above the Kidron Valley) was opened under the direction of Yigal Shiloh between 1978 and 1987. He uncovered 16 occupation levels dating from the Late Bronze Age (14th-13th centuries BCE) up through the present. The three Iron Age structures (the Burnt Room, the House of the Bullae, and Ahi’el's House) all had fallen charred beams covered by the collapsed debris of upper stories (aerial view of the Area G remains at the left; hover over to enlarge; image courtesy of the Institute for the Visualization of History). The Burnt Room (see the plan at the left; hover over to enlarge), found at the northern limits of Area G, contained a destruction layer full of charred remains, including from carved wooden furniture. Some of the wood was identified as boxwood from Cyprus, N. Syria or S. Turkey, with carvings like the motifs found on ivories. 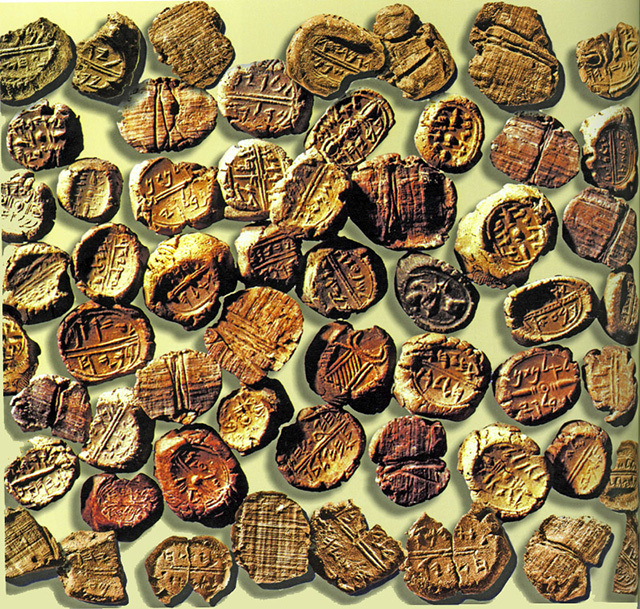 Among the artifacts found were a large number of ceramic storage jars, one bearing rosette seal impressions on two of its handles. 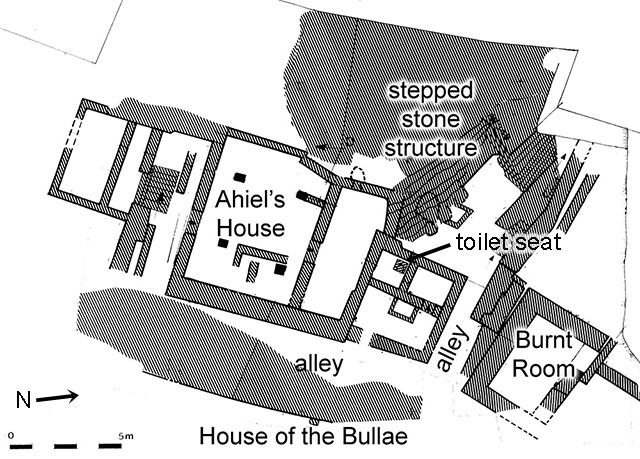 Only a small bit of the House of the Bullae (situated downslope across the alleyway east of Ahi’el’s House; see the plan above) was uncovered underneath a thick layer of burnt debris. However, despite the meager architectural remains, the structure proved very important, because several bullae, pottery vessels, stone weights, iron arrowheads, clay loomweights, and cultic stands were found here. 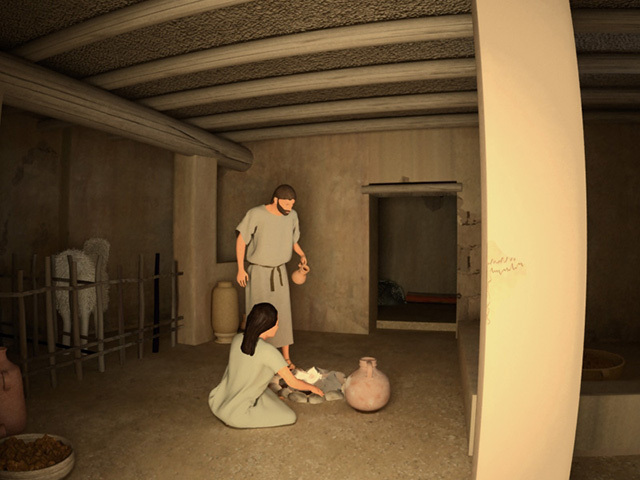 On the floor of the House of the Bullae was found a collection of more than 50 clay sealings bearing Hebrew inscriptions (bullae; see the image at the left; hover over to enlarge; image courtesy of the Institute for the Visualization of History). These bullae are fingernail-sized lumps of clay once affixed to the binding strings of a papyrus scroll and stamped with a seal as proof of the document’s authenticity. The inscriptions include many Hebrew personal names known also from the Bible. Two of the names belong to well known biblical personages. One is Gemaryahu son of Shafan, a high official at the court of King Jehoiakim of Judah, who reigned on the eve of the destruction of Jerusalem by the Babylonians (Jeremiah 36:10-12, 25). The second is Azaryahu son of Hilkiyahu, a member of a high priestly family, who served in the Temple in Jerusalem at the end of the First Temple period (1 Chronicles 9:11). The intensive conflagration that destroyed the house and burnt the documents, also fired the clay bullae, thus preserving them in excellent condition and leaving them fully legible. The best preserved of the Iron Age structures in Area G is Ahiel’s House. 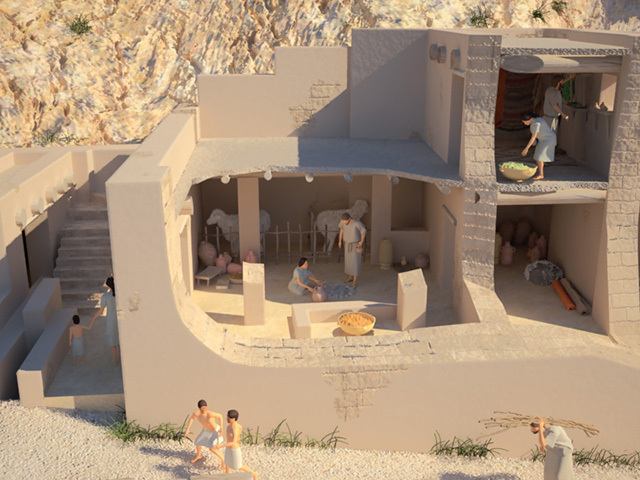 It is a typical Iron Age, four-room, four-pillar house (measuring about 8 x8m) belonging to Ari’el, as archaeologists discovered when they found a limestone slab, mostly likely an ancient weighing stone, inscribed with the owner’s name. Many distinctive pieces of pottery and even a toilet were found in this house. A view inside Ahi'el's house, lower floor where animals would have been kept. 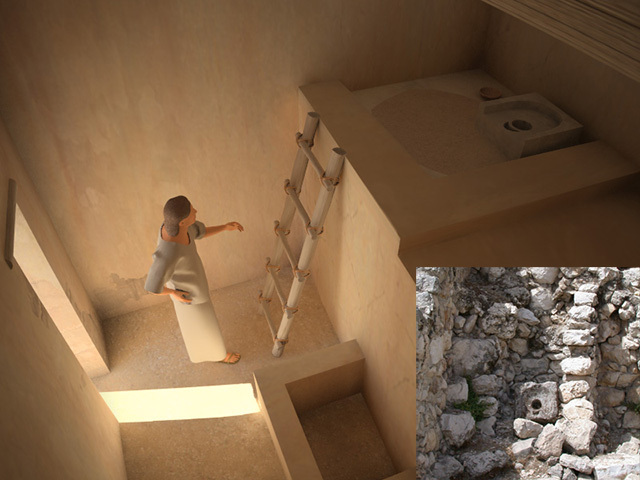 Reconstruction of the room holding the toilet seat, and the seat in context of the excavation. 2000 Excavations at the City of David, 1978-1985. vol. 6, Inscriptions, QEDEM - Monographs of the Inst. of Archaeology, the Hebrew University of Jerusalem, vol. 41, Inst. of Archaeology. 1996 Excavations at the City of David, 1978-1985. vol. 4, Various Reports, QEDEM - Monographs of the Inst. of Archaeology, the Hebrew University of Jerusalem, vol. 35, Inst. of Archaeology. 1990 Excavations at the City of David, 1978-1985. vol. 2. Imported Stamped Amphora Handles, Coins, Worked Bone and Ivory, and Glass. QEDEM - Monographs of the Inst. of Archaeology, the Hebrew University of Jerusalem, vol. 30, Inst. of Archaeology. de Groot, Alon & Donald T. Ariel, eds. 1992 Excavations at the City of David, 1978- 1985. vol. 3, Stratigraphical, Environmental, and Other Reports. QEDEM - Monographs of the Inst. of Archaeology, the Hebrew University of Jerusalem, vol. 33, Inst. of Archaeology. 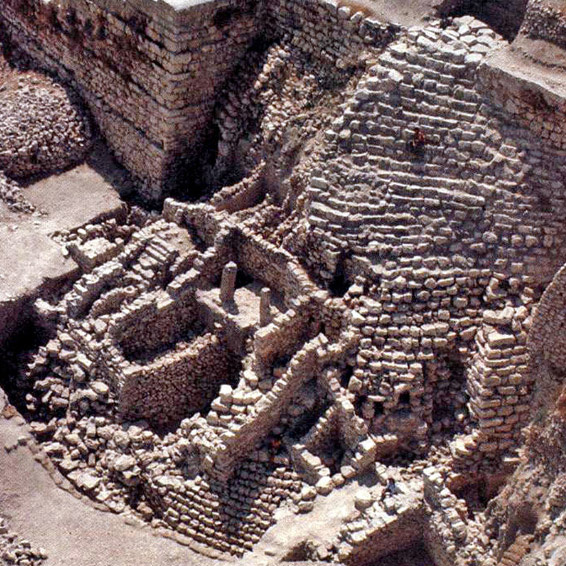 1999 The City of David: discoveries from the excavations. Jerusalem: Inst. of Archaeology, Hebrew Univ. of Jerusalem. 1993 Excavations at the City of David, vol. 1. 1978-1982. Interim Report of the First Five Seasons. QEDEM - Monographs of the Inst. of Archaeology, the Hebrew University of Jerusalem, vol. 19, Inst. of Archaeology. 2nd impression, 1st edition 1984.